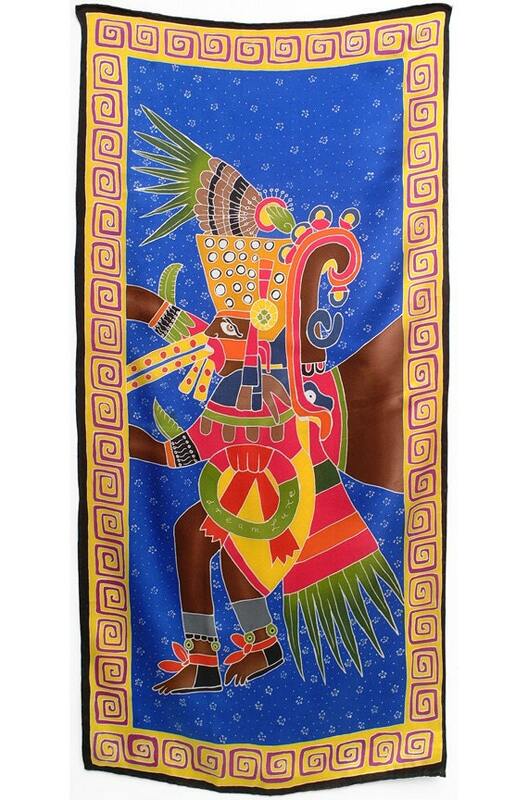 Hand painted silk scarf with Aztec Warrior. 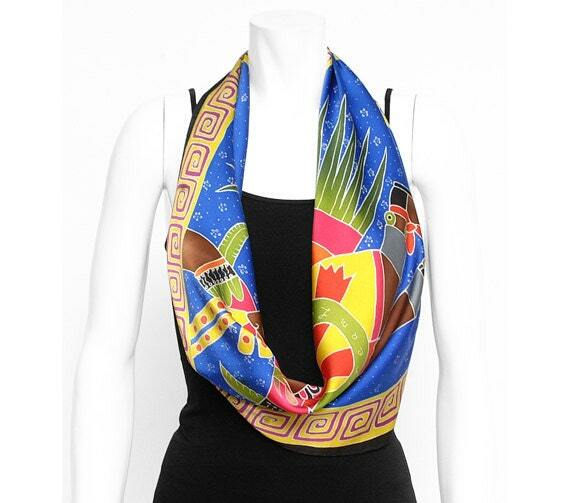 Beautifully detailed Aztec image Batik hand painted silk scarf with a blue background and a tribal boarder. 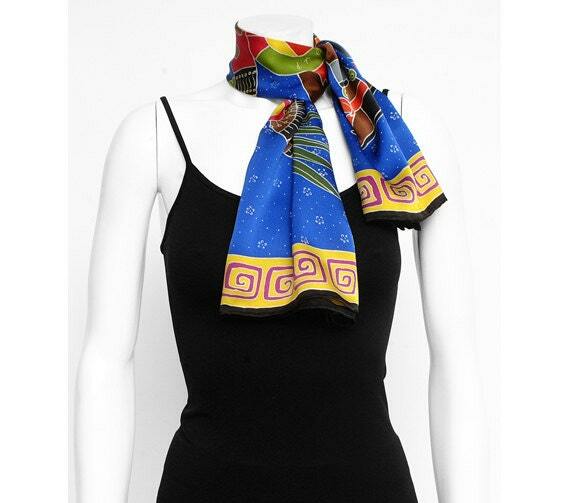 Makes a wonderful Head scarf, neck scarf and a beautiful wall hanging. 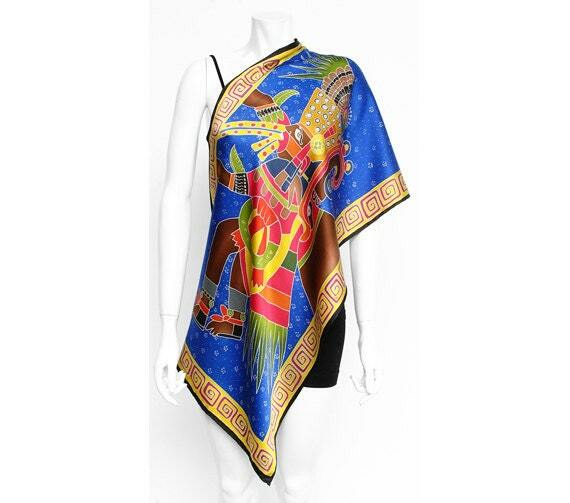 This magnificent hand painted silk scarf for men and women is handmade and painted on 100% natural silk fabric. This silk scarf is individually hand drawn, waxed with hot wax, hand painted with brilliant permanent dyes, wax removed with boiling water and after this long process, the silk scarf edges are hand rolled and sewn. My customer is the individual who appreciates wearing one-of-a-kind, original, and artistic creations. Dreamluxe silk scarves are unisex. These fashionable silk scarves and wearable art can also be creatively transformed into striking decorative wall hangings. I pride myself in creating high quality work and technique with little or no mistakes only acquired through years of experience as Batik artists. But with any hand painted work of art there will always be signs that it was made by an artists hands which adds to it uniqueness and magic.